Expect glamour, roses, rabbits, headscarves, foxes, teapots, crows, parlour games, cake stands, hair and make-up tips and, not forgetting, humongous amounts of magical tea party food that is fit for the Queen of England.. 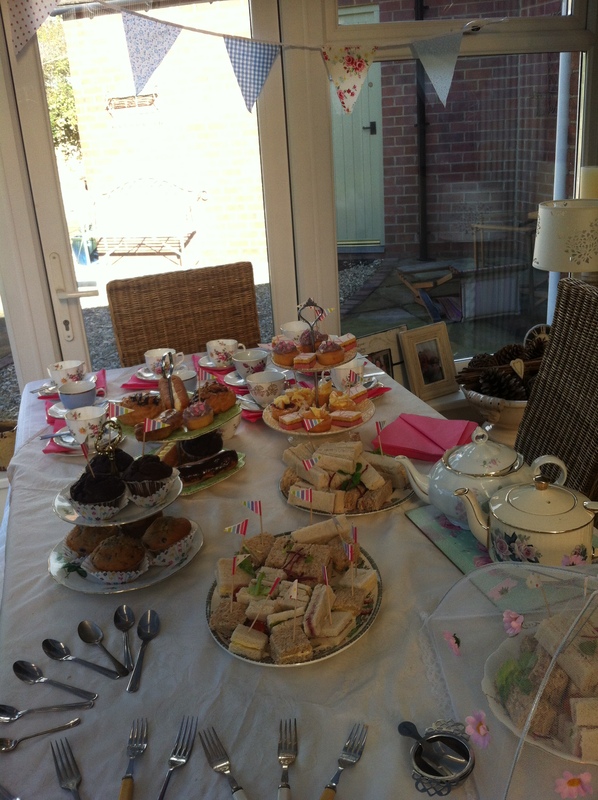 Treat yourself to a vintage tea party! Our Vintage Tea Lady will bring a delightful party into your home or venue, transforming your dining table into a 1940’s haven. 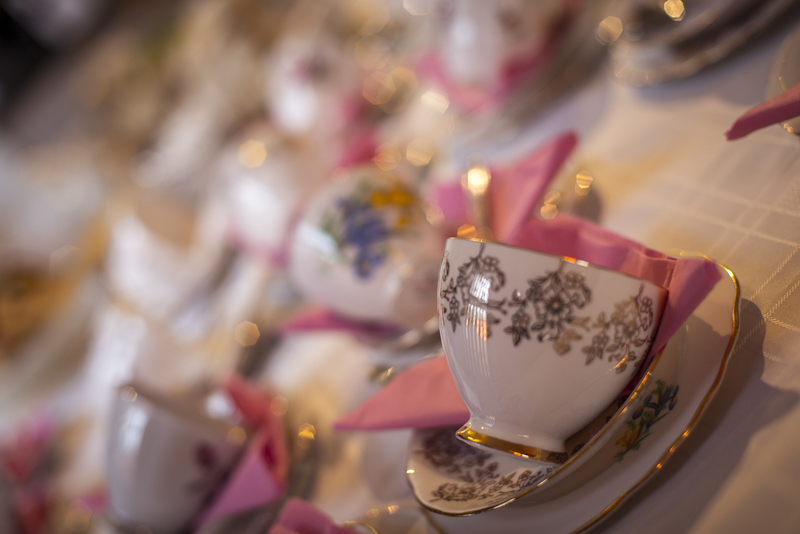 We provide beautiful tea cups and saucers each complete with side plate, cake fork and tea spoon. You also receive two gorgeous cake stands, milk jug, sugar bowl, assorted platters for sandwiches and cakes, two tea pots and one cotton table cloth. Our service includes an assortment of finger sandwiches, cup cakes, pastries, freshly brewed tea and either a traditional Victoria sponge or a thick, rich chocolate cake. All crockery is not in sets (depending on size of party) but all tea cups are complete with matching saucers and side plates. This all adds to the informal, vintage charm of morning or afternoon tea. Our Vintage Tea Lady will be your waitresses for the whole event catering for you from the start and keeping you topped up with tea and cakes throughout your party. And we don’t forget the most important part either our Vintage Tea Lady will wash up everything and clean away afterwards. Relax and enjoy your tea party as you catch up with friends and family at your celebration or, for the full party experience why not let our qualified stylists give you the ultimate vintage party makeover. Speciality teas are available on request. We’ve come over all romantic and have been getting in the mood for some love this Valentine’s Day! We’ve got the secret to making sure your loved one romances you to the High Heavens. And guess what? We’re willing to tell you what it is! Elizabeth Peat has a whole host of lovely treats to make sure you look ever-so-darling on Valentine’s Day. Whether you’re wanting a photo finish look for when he pops the question, loose curls for a romantic dinner for two or a beautiful beehive for a single girls night out, we can do it all. Make sure your nails look perfect with fashionable half moons, polished and pink shaped nails or a classic French style. Oh la la! And make-up? We’ve got it sorted! Using gorgeous products we’ll make you over with any vintage look you desire. Whether you want pouty red lips or a softer vintage make-up look, we’ll be on hand to transform you into the vintage belle that is dying to be released! Have a look at the image and see how we’re taking inspiration from Hollywood. We can produce Angelina’s Golden Globes up-do, Kim Kardashian’s bronzed babe look or go foxy like Megan Fox with curls and a classic vintage lip. Don’t be afraid to get in touch by Facebook or give us a call on 07846502749 and we’ll be able to fit you in! 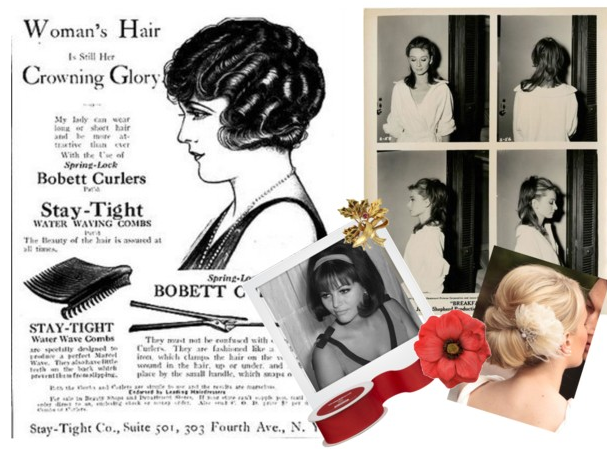 Vintage hairstyles are perfect for the party season where the glamour factor is in full swing! Replace your usual low ponytail and slick of lipgloss for a vintage side bun, a classic red pout and the relaxation that comes with having your vintage hair style done for you. No fuss, no hassle, just plenty of time to relax before you bag the office cutie under the mistletoe! 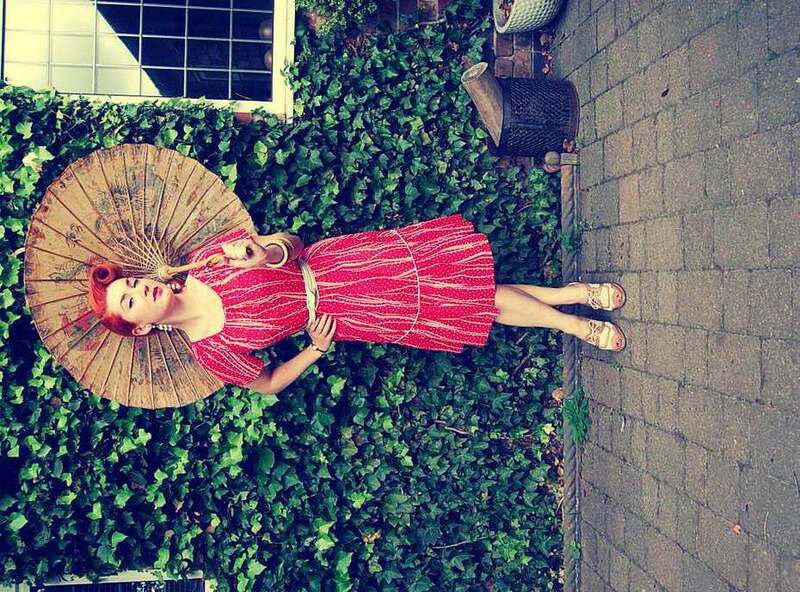 Elizabeth Peat is available in the Midlands for any vintage styling your fluttering heart desires. Whether you’re inspired by 20s flapper girl style and want an up-do complete with feathers or you’re in the mood for some classic Marcel waves, the choice is all yours. And with clients from catwalks to rather stylish members of the public, you know you’re in good hands! To book with Elizabeth Peat for your Christmas or New Year hair makeover, give her a bell on 07846502749. We’ve been taking some serious fashion notes lately and, despite the fact she likes to Do It Like A Dude, Jessie J rocks feminine vintage hair and make-up. And the good news is that her style suits all! Soft side waves and a strong red lip can be worn with a vintage tea dress or, like Jessie herself, given an urban twist with some fierce leopard print! Have a peek at our style-board and tell us what you think of Jessie J’s look. Elizabeth Peat, vintage makeover stylist, is on the road again! Elizabeth Peat, vintage hen party darling and all round supreme stylist, is hitting the road again over the next week. A pinch of rockabilly style? An ounce of victory rolls? A great big lashing of modern vintage style? Check! Elizabeth will be creating styles to make sure you’re the belle of the ball with a unique service offering all you need to be more marvelous than Marilyn! Like a true fairy Godmother, Elizabeth will be appearing at Black Cherry Lounge in Nottingham with a gaggle of giggles and glamourous smiles as she plays host to her own pop-up vintage salon. Perfect pouts, flicks of eyeliner and beautiful beehives are just some of the things you can experience at the pop-up salon. Look out for more information on www.elizabethpeat.co.uk and on our Facebook page! Head down to 8 Talbot Street, Nottingham, NG1 for your glam vintage hair and make-up session! Never one to limit herself to vintage hairstyling in the Midlands, Elizabeth is packing up the car and heading Ooop North to York for a day at York Does Vintage At Christmas! Once you’ve finished swapping your pretty vintage clothes and sipping on tea at the vintage teashop, you can enjoy some much needed relaxation and glam up for a night dancing with an up-do, waves or anything you please. And no need to worry about make-up, Elizabeth will be on hand at the festive spectacular showcase to touch up your power, give you the longest lashes in York and provide a super kissable pout with a retro make-over. 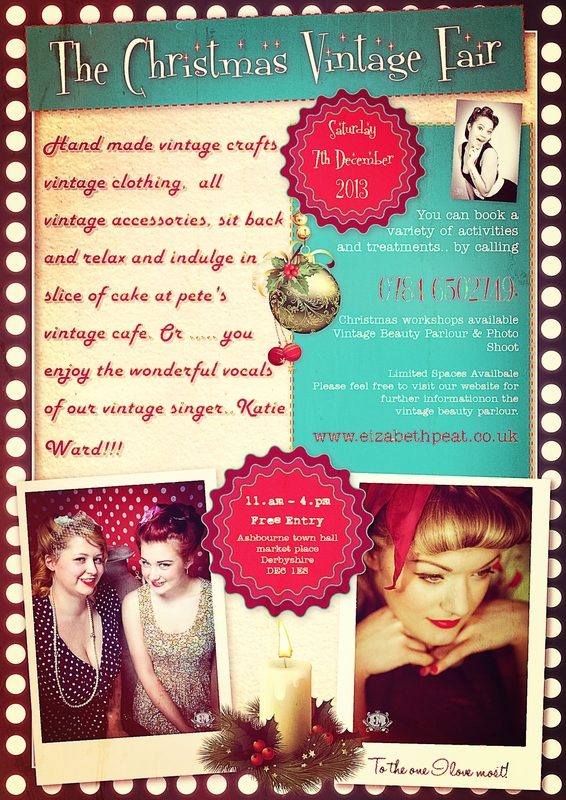 Visit Elizabeth Peat Vintage Hair Salon at 7 Markham Street, York. Where, you ask? Fat Cat Cafe Bar, Friar Gate, Derby from 7pm.